Neil M Gunn (1892 – 1973), one of Scotland’s most distinguished and highly regarded novelists of the 20th century, was a prolific writer. While he is best known for his fictional work Gunn was also a perceptive and meditative essayist who wrote extensively throughout his life on a wide range of subjects from landscape, nature and fishing to politics, nationalism and current affairs. 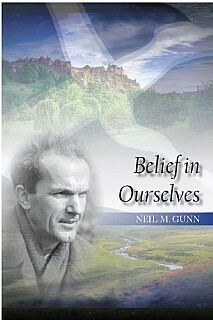 Belief in Ourselves is a collection of essays that focuses on politics in the widest sense, embracing group activity in all its forms from nationalism to both communal work in a social sense and co-operation in crofting and fishing; the focus extends also to literature as a source of inspiration for a nation and a provider of national identity. That most of the essays were written between the two world wars – a period of political uncertainty and economic crisis – brings a sense of urgency to the writer in terms of the resolution of the problems and the exploration of the ideas aired by him. Many of the problems he identifies remain with us, albeit in different forms. Indeed, the imaginative and enlightened way in which Gunn looks at the events of his day have a strange relevance for today’s world. This forms a sister volume to the earlier Landscape to Light, which concentrates on his native landscape and culture and the spiritual aspects of his life and thought. As with Landscape to Light, much of what Gunn writes informs his fictional work. This collection of essays is sure to be of huge interest to all those who appreciate classic Scottish fiction, good writing and collectors of Neil M. Gunn’s work.